Losing weight is half the battle, the real struggle is keeping the weight from piling back on. I myself have managed to trim a few inches from my waist through months of clean living, salads and treadmills, only to pile it back on after a couple of naughty holidays. After a big setback, it’s hard to hop back on the exercise bike and extremely tempting to hibernate away with a pile of snacks and a sense of having let yourself down. However, one woman has shown it’s possible to get yourself back on track to a happier, healthier version of you, twice over. 24-year-old Ariana Omipi from Auckland, New Zealand, had – by her own account – a toxic relationship with food. The digital marketing director experienced constant cravings for food, which made getting down to her ideal weight a real challenge. Ariana would opt for big portions, and would often go back for a second helping. In 2014 – at just 19 years old – Ariana weighed 19 st, 11 lb. 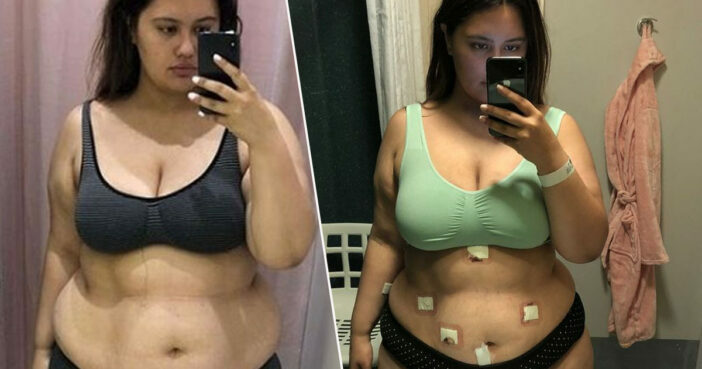 Determined to make a change, Ariana followed a careful keto and low carb diet and managed to snip her body weight down to a trim 10st, 9lb in just 11 months. Ariana’s dramatic weight loss was documented on her Instagram account, where she gained thousands of admiring followers. However, it wasn’t long before Ariana was back to her old eating habits, and by the beginning of 2018, she weighed more than ever before, tipping the scales at 21st, 5lb. This was 10kg more than she had weighed before her diet. It consumed me in a way that I can’t even describe. It was an overwhelming hunger that I could not silence but only block out temporarily. My portion sizes were large portion and I’d constantly feel hungry so go back for seconds, thirds or sometimes even just make another meal. Ariana decided to take action, and in March 2018 she went in for gastric sleeve surgery to help shift the weight she had put back on. This serious procedure involved the removal of 90 per cent of her stomach via keyhole surgery, and has proven life changing for Ariana. At 10st 7lbs, Ariana has dropped over half her body weight and no longer feels intense hunger cravings. She attributes this transformation to the hunger hormone Ghrelin being removed. Ariana’s weight loss has also allowed her to become more active, and she now works with a personal trainer two times a week. I feel like I have control over food. I can cook something without feeling the desire or need to eat it. I have transformed far beyond physical appearance and weight loss this year and I am so immensely happy that I am excited about my life and what is to come for my future again. Of course, gastric sleeve surgery shouldn’t be the first port of call for those trying to lose weight, and is intended for those who are classed as ‘morbidly obese’. However, it is good to hear Ariana is feeling more in control over her relationship with food. All the very best of luck to her.